The Adrienne Theatre is just north of Rittenhouse Square. Take Walnut Street to 20th Street and turn right. Travel one block to Sansom Street and turn left. The Adrienne is one-half block on the left. A parking garage is across the street on the right. The Playground is the first door on your left as you enter the building. Take I-95 North to exit 12 (Route 291 to I-76). Follow signs to Center City Philadelphia (I-76 West). Get on I-76 west to Exit 345 [Old Exit 39] (I-676-Center City). Travel eastbound on I-676 to Broad Street. Turn right onto 15th Street at the end of the ramp. Travel south on 15th Street for 8 blocks (stay in right hand lane when passing City Hall) to Sansom Street. Turn right onto Sansom Street and travel west for 5 blocks to 20th Street. The Adrienne is one-half block on the left. A parking garage is across the street on the right. The Playground is the first door on your left as you enter the building. Take I-95 south to exit 17 (I-676 Center-City off-ramp). Take Westbound I-676 for 6/10 mile. Exit on Broad Street. Turn right onto 15th Street at end of ramp. Travel south on 15th Street for 8 blocks (stay in right hand lane when passing City Hall) to Sansom Street. Turn right onto Sansom Street and travel west for 5 blocks to 20th Street. The Adrienne Theatre is one-half block on the left. A parking garage is across the street on the right. The Playground is the first door on your left as you enter the building. Take I-76 to Exit 345 [Old Exit 39] (Center City-I-676). Travel eastbound on I-676 to the Broad Street exit. Turn right onto 15th Street at end of ramp. Travel south on 15th Street for 8 blocks (stay in right hand lane when passing City Hall) to Sansom Street. Turn right onto Sansom Street and travel west for 5 blocks to 20th Street. The Adrienne is one-half block on the left. A parking garage is across the street on the right. The Playground is the first door on your left as you enter the building. 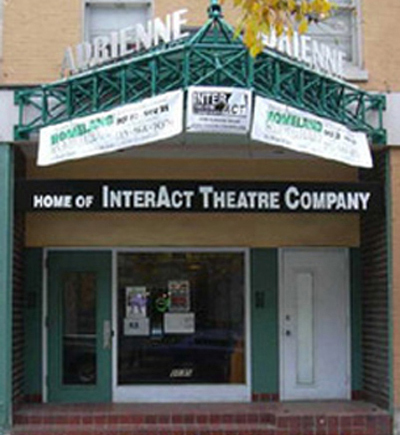 The Adrienne Theatre is located within a 15 minute walk from both Suburban and 30th Street stations. Center City buses run along Market, Chestnut, Walnut, and 20th Streets and have stops as close as a block from the theatre. Visit SEPTA’s website at http://septa.org and use the Trip Planner in the left-hand menu. The Playground is the first door on your left as you enter the building. Metered street parking is available on several blocks in all directions surrounding The Adrienne. There are many parking garages and outdoor lots within a few blocks of The Adrienne. The closest is located directly across the street at 2027 Sansom. Additional parking facilities are located at 125 South 20th, 2036 Chestnut, and 2101 Chestnut. For a list of nearby parking garages visit http://philadelphia.centralparking.com/Philadelphia-Rittenhouse-Square-Parking.html.